So I lasted three days before I jumped off the bandwagon of my own advice. Number One on my Advice List (Know-It-All) from just a few days ago was to ALWAYS say you feel pretty good when someone asks you how you are. No casual acquaintance really wants details on your phlegm. Right after I wrote that, my husband came down with a really bad cold. Two days later I came down with a mild cold. I think mine is mild and his is horrible because of the amount of complaining that has accompanied our illnesses. But to be fair, I really do think he was a lot sicker than I was. He looked and sounded terrible. I didn’t look my best on Saturday, but then I pulled myself together and put some makeup on. We had planned to go apple-picking on Sunday at the gorgeous orchard we visit every year, and it was a warm beautiful day. So we took our medicine and went on with our plans. 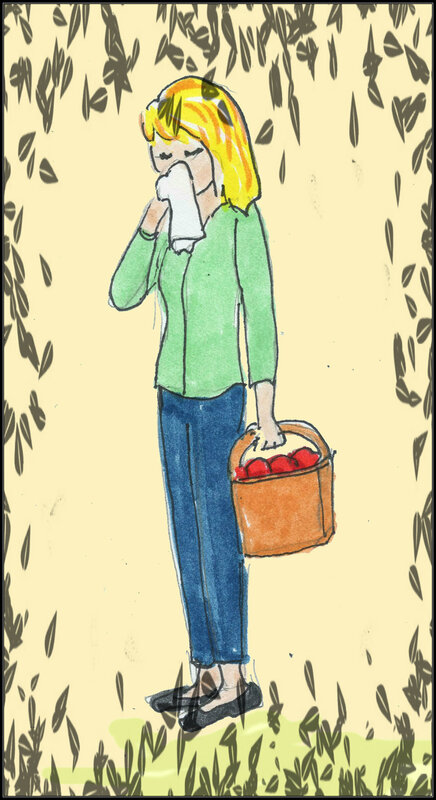 At first we felt a little chilled, but as we walked (and walked – it’s a big orchard), we began to feel better. Of course the apples we like were acres away from the pears we also wanted. So it wasn’t long before our bags felt too heavy, our noses too runny, and our foreheads hot and sweaty. We admitted to each other that just perhaps we weren’t quite up to it. It is nice to make allowances for your obvious physical shortcomings. And I ran into some old friends – fellow writers who helped me on the first draft of my still-in-process novel. i will use as an excuse that I was a bit light-headed from the meds. Because I greeted them warmly, and kissed and hugged them both. I said this after I kissed them! I wanted to smack myself right on my sweaty forehead. I felt so bad I went to a restaurant and had a big cheeseburger and french fries. And ate every bite. So there went Advice #8. I know some people who lose their appetite when they are sick – not me. I eat like a horse. Especially with a cold. Those french fries were fabulous. Hubby actually says, “Lord Help me!” No kidding! His mother used to say that. ha ha ha on both counts! Hubbs moans loudly and often to the point that I have asked him if he’d like help out of his misery? In the sweetest voice possible, of course! I hope it’s another two years before I run into them again. feel better soon… am fighting a cold myself… only it’s not too bad. I’m fine. Even went to Yoga tonight. I am so lucky (or maybe not) that Bill just stays in his recliner and never asks for a thing and won’t admit anything is wrong until it’s time to go the ER! May you both be well soon! Stick with the burgers and fries too. Oh, for a stoic man! Ergo, we know that it’s bad news if he gets sick, because whatever it strong enough to knock himself out, just might kill the rest of us! My husband has the doctor on speed-dial. I do love him, but when I said, “in sickness and in health” I didn’t really mean it. You and I are married to the same man. I don’t know how he survives his cold. They’re always life or death. And then when I get a mild cold, even if its months later, he says, “I knew you’d get my cold.” As though his is all-powerful. Oh yes – he has had many a close call with sniffles. Colds are evil…. yesterday a patient said to me (as all of us in the pharmacy sniffle and cough, not just the patients) there we are able to fly to the moon and still cannot fight a simple cold properly…. at least eating helps me too, those french fries sound very good to me. having one cold overtaken my head and face just now I absolutely agree- evil! And feel hungry, just like you, chicken soup, tea and lots of sweets seem to hold me up. I did feel pretty good for a while after the cheeseburger and fries. Obviously you are not up on the latest in men’s health and medical science. Studies show that whining reduces the length and severity of a cold. Maybe those article don’t show up in the women’s magazines. So without all the complaining, he’d be sick for a month? 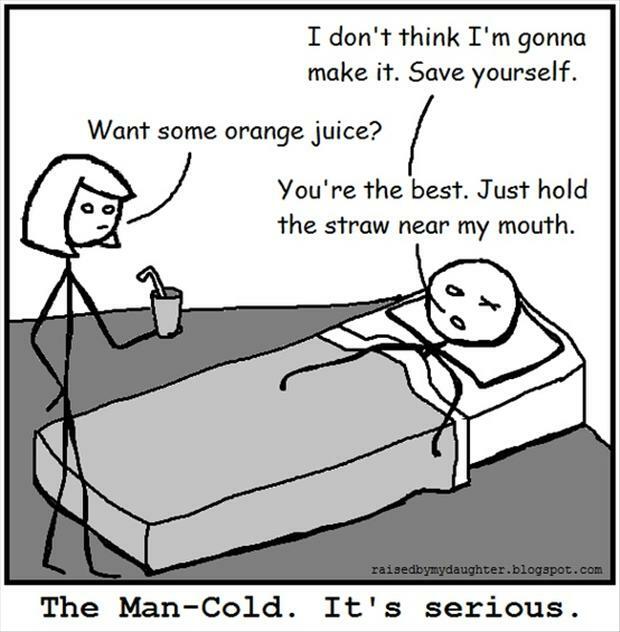 Pretty darn funny, especially the announcing “I have a cold” right after the greeting = you did the only thing I could think of – cured with a cheeseburger and fries! All that was missing was a nice, thick shake. Please do not tell He-Who that you eat French Fries when you are sick. That is the last frontier I have been able to keep French Fry Free.